Watchers over Ghana’s oil have sounded the alarm bells, upon learning that ultrasonic export metres, installed on FPSO Kwame Nkrumah, the Jubilee Field production vessel, were not functioning properly, and therefore currently, the major means of determining volumes of crude oil exported was by tank dipping. Notwithstanding the fact that the Jubilee Field has metres right from well heads, through the storage tank of the FPSO, which has the Ghana Revenue Authority (GRA) seals, the news of the dysfunctional export metres has raised suspicions even though the alternative method, which is tank dipping, is internationally recognized and accepted as a means of measure. The export metres, measure the flow of crude oil from the storage tank of the FPSO to loading tanks. However, before discharging crude from the Jubilee FPSO storage tank, a tank dip measure is recorded and repeated after discharge, to strike the difference. A dip of the loading tank is also taken before and after loading to ensure that the volume of crude oil that it has received is equivalent to what has left the FPSO storage tank. This method, according to industry experts, is what is generally used and have expressed surprise at the seeming rancour over the matter. The Business Analyst gathered that tank dipping is captured in the agreement among the Jubilee partners as an alternative means of measuring the export volumes. Mr. Yaw Agyemang-Duah, Managing Director of GOIL Limited, who has close to thirty years experience in oil trading, has cautioned against jumping to conclusions on the matter. “We should be careful; unless there is clear evidence of cheating there is no need to raise alarm,” Mr. Agyemang-Duah stated. “The Tema Oil Refinery (TOR), Bulk Oil Storage and Transport (BOST), National Petroleum Authority (NPA) and oil marketing companies, all use tank dipping as the means of measuri ng volumes of crude oil and other petroleum products,” he disclosed. He said just as dipping had some degree of tolerance, so was metering, adding that when the metering system failed it was normal to fall on tank dipping as the next alternative means of measuring crude volumes. According to him, even metres use to fail, and that was why they are calibrated periodically. An oil sector revenue monitoring officer with the GRA, Mr. Basil Kondoh, is of the view that there are teething challenges facing state institutions that ought to be addressed quickly to facilitate efficient and effective monitoring. “The upstream-midstream petroleum industry is a new sector in the country so all institutions having anything to do with it are currently building capacity in the handling of their various obligations even as the industry is already operational; challenges are therefore to be expected,” Mr. Kondoh argued. According to him, there was the urgent need to build up the capacity of officers of the GRA to enable it carry out its functions efficiently and effectively. Speaking exclusively to The Business Analyst, Mr. Kondoh said logistical constraints facing Ghana Standards Board (GSB) has not made it possible for that institution to confirm the calibration of the measuring instruments on FPSO Kwame Nkrumah. Responding to specific questions raised by this paper, Mr. Kondoh said even though there were communication challenges at the initial stages of operation on board the FPSO, “after about a month, reliable communication was restored.” He said communication on the FPSO is much better now except that though our officer can make a call from his cabin he cannot receive calls directly there since in-coming calls go to the Mooring Master. He said the real problem with communication has to do with VHF system used by Tullow, which is not suitable for GRA’s purpose and therefore was considering acquiring satellite phones, both on the FPSO and the tanker. On the importance and interest of the GRA knowing the quantity each partner lifted and the sales value, Mr. Kondoh said these have implications for determining the partners’ profits and therefore corporate tax liabilities. “The FPSO is a customs area, such as the port, bonded warehouse, the refinery, petroleum depot, factory, etc. and therefore the presence of GRA on the FPSO is to secure the revenue interest of the country, which comes in various ways,” the GRA official explained. He said the two systems for determining quantities of oil released from the FPSO, comprising the use of metres and secondly, dipping of the tanks before and after the release, serve as a check on the other. 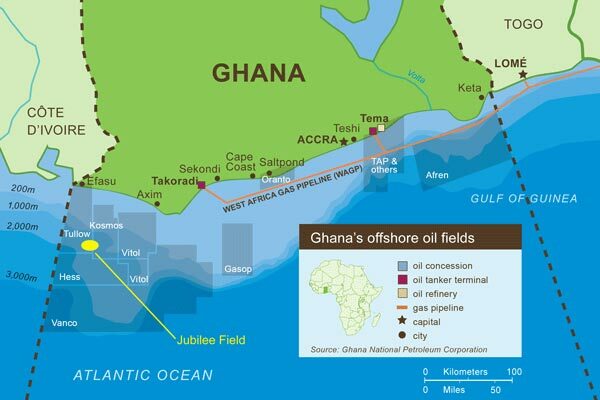 He confirmed a statement by Director of Exploration and Production of the Ghana National Petroleum Corporation (GNPC), Mr. Thomas Manu, that the Jubilee Field Operator had ordered for export metres to be calibrated and delivered by July 2011.